An unrivalled 1,421 general purpose political committees spent a record $159 million in the 2014 election cycle, according to a new edition of TPJ’s biennial “Texas PACs” report. 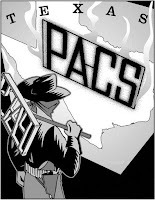 The 31-page report analyzes PAC spending by major economic and ideological interest groups. It also includes sections on dark money, new PACs, fast-growth PACs, shrinking PACs, extinct PACs and the specific-purpose PACs that promoted ballot initiatives for water and road projects. The appendix ranks the 262 top PACs that spent more than $100,000 apiece. Read the media release and the full Texas PACs report.